There is a special bonus fourth segment as well, but I’ll save that for later. In iOS 10, there are several enhancements that will improve the performance of your UICollectionViews – some of which you will manually need to leverage, and some you will get for free. Before dropping into the new features of iOS 10 UICollectionView, the presenter gives a nice overview of what it means to “drop frames” and what it’s bad. In order for your app to have “buttery smooth” performance, a hallmark of iOS apps, you must strive for app animation that performs at 60 frames per second. This means that a given frame of the user interface must be displayed in less than 16.67ms in order for the animation to appear “smooth.” Otherwise, when the frame rate drops lower than that, it’s apparent to the user in the form of a choppy animation. The easiest way to make the frame rate drop, is to do things like add blocking, long running method calls on the main thread in the middle of your animation. Here’s an in-depth article from Facebook on how they measure and ensure a highly performant news feed in their app. cellForItemAtIndexPath – The heavy lifting of populating your cell’s data from your model happens here. willDisplayCell – Lightweight preparation for when you cell is about to go onscreen. Cell comes on screen, and as scrolling continues starts to move offscreen. In general, this flow is unchanged between iOS 9 and iOS 10. The different is when these methods are called. Apple has optimized when willDisplayCell is called. In iOS 10, it’s now called at the very last minute before the cell goes on screen. This helps to balance out the CPU performance in drawing cells, but not executing that code too early. Additionally, another enhancement Apple has made in iOS 10 UICollectionView is that cells are not put on the reuse queue as aggressively as in the past. Instead, after a cell leaves the screen, it is kept around a little longer in case the user decides to swipe the cell back on screen. to allow for you to start downloading the images with Grand Central Dispatch of an NSOperationQueue such that when the cells containing the images comes on screen, the images will be downloaded and ready to go. If you need to, you can opt out of this behavior by setting isPrefetchingEnabled to false, but why would you? As part of pre-fetching, realizing that cellForItemAtIndexPath may be called for cells that never end up coming on screen – because the user stopped scrolling before they were shown. Also, it’s really important that you keep the work in willDisplayCell and didEndDisplayingCell really light. All the heavy lifting goes in cellForItemAtIndexPath. Apple described pre-fetching as an “adaptive technology” which I assume to mean that it’s level of “predictiveness” varies by use case for a given application. And as bonus, this exact same pre-fetching API is also available on UITableView via UITableViewDataSourcePrefetching. Prior to iOS 10, estimatedItemSize has existed on UICollectionViewFlowLayout in order for you to provide an estimate size for the items in your collection view. Sometimes it’s hard to predict the size of items in your UICollectionView. Realizing this, Apple has introduced automatic item sizing for your UICollectionViewFlowLayout. Simple set the item size to the constant UICollectionViewFlowLayoutAutomaticSize and UIKit will make smart guesses based on past measurements of your items in order to automatically predict item sizes for future items. It will keep a running tally of all the cells it’s already sized, and use that to influence its future sizing estimates…making the sizing much more accurate…leading to better performance and a more accurate layout. There are some additional methods on UICollectionView that you should take a peak at too that enable you to add more advanced animation and update your data model if appropriate. New in iOS 10 UICollectionView is the ability to reorder with paging! That’s it! 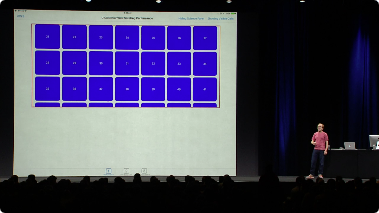 The presenter describes it as an interaction that feels just like moving icons between pages on your home screen. If it wasn’t awesome enough that UIScrollView and UICollectionView got the control, but you are also no longer constrained to needing a UITableViewController if you want an out of the box pull to refresh control (which was a pretty annoying prior limitation in my opinion). I have plans to do an in-depth example of how to use pre-fetching with Grand Central Dispatch in order load remote images in a UITableView sometime in the future. I recently ran into a problem in one of my apps that this exact thing would have solved. Essentially I had cells in a UITableView that were of varied height based on a remote UIImage being loaded. I ended up needing to set a static height on the cells to achieve a high frame rate and scaling the images, instead of properly sizing the cells according to the natural height of the image. It wasn’t the end of the world, but there was some extra white space in the cells that wasn’t needed. How do you plan on using these new changes to iOS 10 UICollectionView? My collection view which worked smoothly on iOS 9 on different, started awfully lagging even on the fastest devices when compiled with Xcode 8 / iOS 10. Disabling prefetching made it work as smooth as before. Looks like nothing comes without the price. If you scroll over complicated UI in collection view I recommend to not use prefetching delegate as it leaves you no time on main thread to prepare next items. Because the collection view re-uses old cells and doesn’t reload them as much, if you change content in cells, off-screen cells don’t update sometimes. So turning off pre-fetching fixes that.